4 Dinner plates - price is for all 4 plates. Gray leaves, band and trim. Has a lovely ring when tapped with a fingernail. Only light wear. Very good condition. 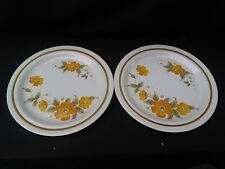 2 Hallkraft Mikasa Dinner Plates - SPLENDROUS - KA102 - 10 5/8"
The bottom of the bowls is marked with They would make a great addition to your set. Delicious pattern CAA39. Set of 4 short mugs. Set of FOUR. White Shelf 4A. This dinner plate in the Garden Club EC452 Flower Fest pattern was made by Mikasa from 1977 to 1982. Research shows that the pattern has been discontinued. For sale is a beautiful Mikasa Kabuki pattern dinner plate. One Mikasa Fine China Kabuki L9011 Japan Dinner Plate Classical Asian Floral Pattern Green and Orange on White Porcelain with a Fine Line of Silver at the rim There are no cutlery marks or other damage that I can see. Measures about 10 1/2 Inches across Excellent condition. No chips, cracks, crazing, or noted marks. Please see photos and ask any questions regarding item or condition. Graphics are that of oranges and orange blossoms. Made in Japan. 5 Mikasa Cera Stone Dinner Plates, Zephyr, Orange & Brown. Made in Japan. #3145-KI. Most plates have some discoloration on an area on edge, fronts have minor utensil marks. Approximately 10”. 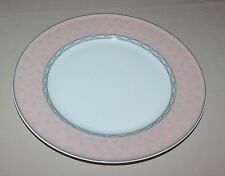 This is a pair of Mikasa Pear Finale 10-3/8" dinner plates. They are in excellent condition as shown. Circa 1974 to 1979. Marked Mikasa Paprika Terra Stone E1258 Japan. This is a Mikasa saucer in the Dutch Garden Pattern that was made from 1981-1984 only. It is a cream color with orange and yellow flowers. It is in excellent condition with no chips, cracks or crazing. Message me with questions. Buy with confidence. "Cimmaron" design, pattern #CAC69. The décor is pristine and unblemished, the colors are vivid with no fading or discoloration, and the glaze shines like new. Stoneware with coral and maroon bands on the rim. Pattern number P3001. A Ben Seibel shape. 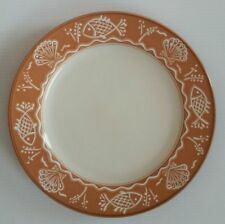 One (1) dinner plate from Mikasa in the CORAL SURF pattern. MIKASA TERRA STONEWARE SOUP SALAD CEREAL BOWLS Set of 2. Very pretty. Elegant Dinner Plate by Mikasa. This pattern is hard to find and rare. It is the pattern Majestic, #F4005. I think you will find my rates to be very fair. Manufacturer: Mikasa. Piece: Cup & Saucer. China - Dinnerware Crystal & Glassware Silver & Flatware Collectibles. Canadian and international orders. U.S. Expedited. This is an adorable Mikasa Cherry Blossoms vase. It stands 5.5" tall and is in excellent condition. It is marked "Mikasa" on the bottom. SLIGHT FLAW. Decorated with Rust Orange Floral design. Age: 1980's. Vintage Ben Seibel Mikasa Mexicana Coffee Pot Sunflower Orange - perfect! Seems to have had little or gentle use. There are a few small dark marks in one spot on one exterior side but other than that nothing to note. Terra Stone - Orange Sherbet. Mikasa Bowl. Cereal Bowl. This bowl is in very nice condition with virtually no signs of use. 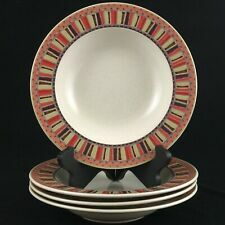 3 Mikasa Mediterrania Rick Rack Pattern Dinner Plates Size: 10 1/2" From BOHO to MOD deliciously vintage 1960's dinnerware. Vintage Mikasa Mediterrania Rick Rack Pattern Actual: 1960's Pattern: Rick Rack by Mikasa Description: Brown Design On Cream, Manufactured in Japan There are no cracks or chips on any of the dishes. There is some natural etching on the back of one plate, and very light ware consistent with age. In overall amazing vintage condition. Auctiva's FREE Counter. 11" round. Estate, pre-owned item. SPECIFICS : Produced by Mikasa 1970's # 1058. I add new stuff daily. Manufacturer: Mikasa. Pattern: PALETTE ORANGE. Piece: Sugar Bowl. Canadian and international orders. U.S. Expedited. Mikasa Garden Club MAYFAIR EC409. Dinner Plates 10 3/4".